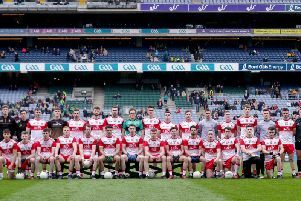 Tyrone senior hurlers captured back to back National League titles at sunny Gerard McGleenan Park, Keady on Saturday when they emerged victorious over Monaghan on a 0-18 to 1-11 scoreline. The sides had drawn at a wet and windy Healy Park in the first game of the league, but it was the Red Hands who’d go through the league unbeaten, that draw being their only dropped point. This victory now earns Tyrone a shot at Donegal for a promotion to Division 2B. However, it wasn’t all plain sailing as it was Monaghan who made the better start as Tyrone seemed to struggle with the occasion. Monaghan raced into a four point lead courtesy of points from the ever dangerous Stephen Lambe and three quick fire frees from Ronan Meegan. Tyrone were struggling, amassing as many wides as Monaghan were scoring points. Indeed, the Farney County could have been out of sight but for some stout defending from a solid Tyrone defence. Gradually, Tyrone began to establish a foothold. A Damian Casey free on fourteen minutes followed by another two minutes later seemed to settle the nerves. Gerard Gilmore raced through to point on eighteen minutes and three minutes later Conor Grogan sent over a superb score to level matters. The lead only lasted a minute as Stephen Lambe squeezed over his second point a minute later to restore Monaghan’s advantage. The game ebbed and flowed with neither set of forwards able to make inroads. However on twenty nine minutes Mark Winters hoisted over a long range point to restore parity. Drama ensued just a minute later when Conor Crogan was fouled and referee Liam McAuley of Antrim awarded Tyrone a penalty. Damian Casey’s effort was superbly saved by corner back Kevin Crawley, the Inniskeen man just getting a hurl to deflect the sliotar out for a 65. The subsequent 65 sailed wide but a Damian Casey free two minutes from half time sent Tyrone in as leaders on a score of 0-6 to 0-5. Whatever Mattie Lennon and his backroom team said at half time, it was a different Tyrone which started the second half. Gone were the nerves that marked the first quarter. Damian Casey fired over his fourth score from a free shortly after the resumption followed by a great point from Justin Kelly. Casey fired over from a tight angle a minute later to increase the gap to four. Rory Meegan shot his fourth pointed free and Monaghan’s first score of the second half on forty five minutes. Almost immediately Casey sent over a sixty five to restore Tyrone’s advantage. It seemed that whichever side got the first major might go on to win and Tyrone’s character was put to the test when Stephen Lambe stole in to grab the game’s first and only goal on forty five minutes, slamming the sliotar to the Tyrone net and giving keeper John Devlin no chance. The same player shot over the equaliser two minutes later. It was Mark Winters who restored Tyrone’s lead and a Gerard Gilmore point minutes later from an impossible angle give Tyrone some breathing space. Casey and Aidan Kelly slotted two more points sandwiching a pointed free from Rory Meegan. Kelly’s point was a superb effort that left three points in it, 0-14 to 1-8. Tyrone manager Mattie Lennon brought on Martin Grogan and Conor Gallagher for Conor Casey and Gerard Gilmore while on the Monaghan side Stephen Forde and Pauric Dowdall for Martin Murphy and Conor Boyle. However, fullback Peter Treanor received his marching order on sixty five minutes which left the Farney County with an uphill struggle. Conor Grogan and Damian Casey extended Tyrone’s lead to five points before Meegan again pointed from a free. The Tyrone defence was playing superbly limiting Monaghan to just a few opportunities which came to nothing. Casey shot over his ninth point of the day before Niall Garland shot Monaghan’s final score. Chris Cross was the final name on the score sheet and the final whistle was greeted with rapturous celebration for all connected with the Tyrone camp. Captain Damian Casey, who had to retire injured a few minutes from the end, replaced by Ricky Kelly, accepted the Division 3A Cup from a disappointed Martin McAvinney. All in all, it was a superb day for Tyrone hurling as their minors had lifted the Ulster Minor hurling league just two hours earlier, their game having been switched from Keady to nearby Middletown.